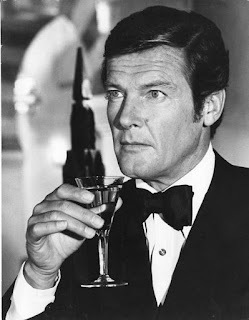 Ladies and Gentlemen, may I introduce you to the real Bond, James Bond "Martini"? 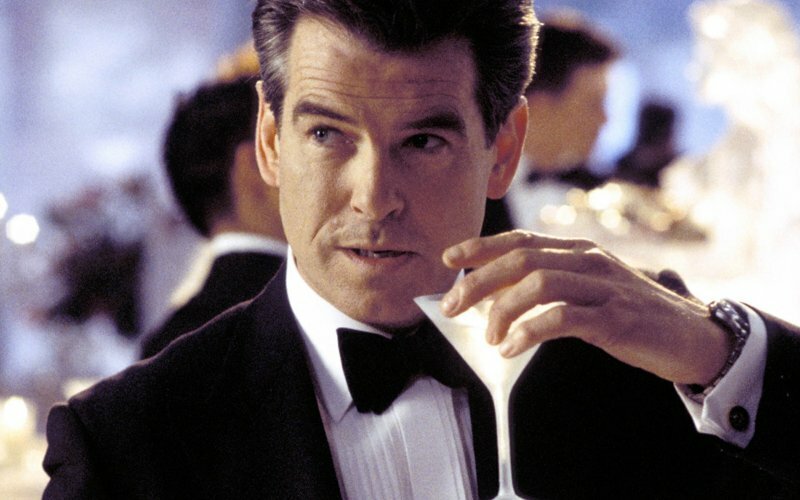 "A dry martini,' he [Bond] said. 'One. In a deep champagne goblet.' 'Oui, monsieur.' "Just a moment. Three measures of Gordon's, one of vodka, half a measure of Kina Lillet. Shake it very well until it's ice-cold, then add a large thin slice of lemon peel. Got it?" There you have it. This is how it all started and I would like you to note that this is not really a martini at all (dry or otherwise) as it uses both gin and vodka and Kina Lillet, which is not vermouth, it is an aromatised, quinine infused, wine based, orange flavored liqueur. To confuse matters further, KINA* Lillet is no longer available. The name was changed to Lillit Blanc and the quinine was completely removed in 1986. 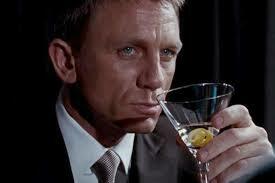 I always find it interesting that that Bond called out the gin and the Kina, but not the vodka. As for the name? 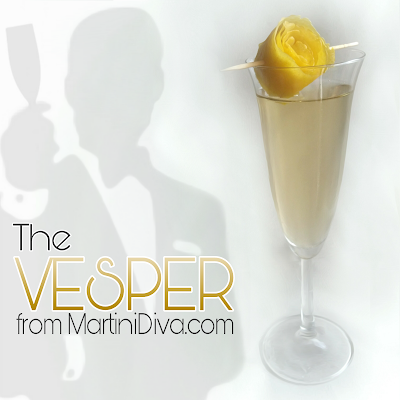 Bond named this cocktail a Vesper after a female double agent, Vesper Lynd, in Casino Royale. 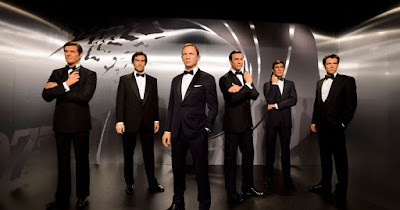 As for Shaken, Not Stirred The first appearance of that phrase appears in Fleming's novel Diamonds Are Forever (1956), but Bond himself does not utter the words until the book Dr. No (1958) where the actual phrase is "shaken and not stirred" not "shaken, not stirred." The first time the phrase is uttered by Bond himself on film is by Sean Connery in Goldfinger (1964). In 2005 the American Film Institute listed the phrase #90 on Best Movie Quotes of the last 100 years. So, James Bond (Ian Fleming) created the very first designer martini way before the Cosmo or an Appletini burst upon the cocktail scene, but sadly his cocktail can no longer be made as quoted. However a close approximation can be "Shaken and Not Stirred" with a bit of clever substitution. 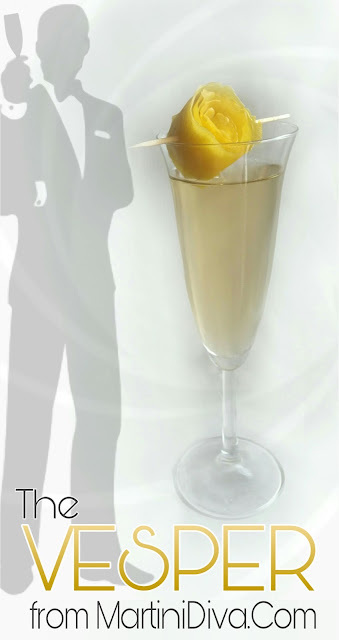 DIRECTIONS Shake ingredients with ice, stain into chilled flute, garnish and serve. As for an actual martini? 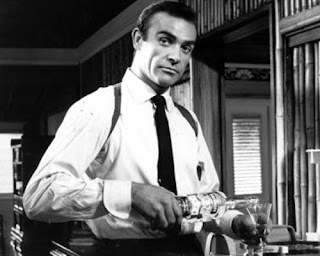 Three years after his Vesper, Bond specified his martini as: "six parts vodka, one part vermouth, shaken" in Fleming’s 1954 novel Live and Let Die. Now THAT'S dry! * Kina Lillet) aka quinine, is a quinquina, a cinchona bark liqueur.